Planning My South Texas Wedding one 'Two-Step' at a Time! Bride and Groom Toasting Flutes Giveaway!! I am so excited to be hosting a giveaway of these Bride and Groom Toasting Flutes made by Winston Glass Works! Aren’t they adorable?!?! These flutes are everything I expected them to be and more! They are great quality glass and the etching is done to perfection! They are two 6 oz hand engraved Champagne Toasting Flutes. Yes, that’s right, hand engraved. Robert takes the time and hard work to etch these flutes personally. He does the etching using an abrasive blasting to create a deeply contrasted image. Since these are etched, they are even dishwasher safe. How amazing is that?! Not only will you be able to use these on the day of your wedding to have lasting images of your first toast and meal together as husband and wife, you could use them for many years to come. I absolutely love these personalized Bride and Groom flutes but his talents go so much further than that. He can also personalize glasses with dates, names, etc. These would also be great gifts for your bridesmaids and groomsmen!! If you are a couple that is looking for something that is a little less traditional but absolutely adorable…I think these are a great alternative! How cute! He has beer mugs, coffee cups, wine glasses, pint glasses, shot glasses, cocktail glasses, hi-ball glasses, vases, and vanity jars. He even has unity candle vases!! This is your one stop shop for personal glassware for your wedding! Further more, you could order from him for any event!! Birthdays, anniversaries, weddings…the options are endless for a gift that is as amazing as this! I am also happy to say that he is a fellow TEXAN!! He does ship everywhere in the US though, for very reasonable prices. You can purchase these or any other glass work of his by going to Winston Glass Works. Check it out and you will be amazed at how many options there are! 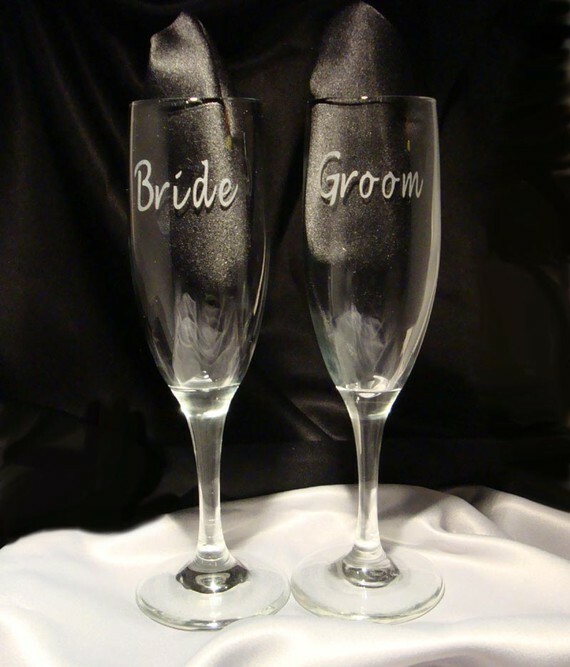 One winner will receive their own set of Bride and Groom Toasting Flutes!!! You can enter into the giveaway by following the entry options below. The winner’s information will be given to Robert at Winston Glass Works and he will contact you regarding your win. Remember to be understanding of shipment time. These are custom made so it will take 5 days from the time of your selection for the production time before they will be shipped. Enter into another current Giveaway on my blog and come back and let me know which giveaway you entered into. Make sure to leave your e-mail address in every comment so if you win, I can contact you. The winner will have 48 hours to respond to the e-mail and if no response, a new winner will be contacted. Entries will be accepted until October 7th at 11:59 pm CST. This giveaway is open to those who live in the U.S. and are 18 and up in age. *All opinions are my own and I received no compensation for this review. I did receive one set of bride and groom toasting flutes from Winston Glass Works to host the review. Posted in Giveaway. Bookmark the permalink. On the Winston website I love love love the His Mrs. Her Mr. flute! I like the monogram goblets. I also entered the bridal hanger giveaway! I also entered the Clay Bouquet Shop $25 Gift Certificate Giveaway!! Follow South Texas Wedding on Twitter!